By 2009 it seemed likely that Russia will propagate its new Over The Horizon (OTH) radar system around the periphery of Russia -- to include the four Russian naval fleets, the Pacific, Northern, Baltic, and Black Sea. Over The Horizon Radar (OTHR) utilises the Ionosphere to reflect the radiated signal 'over the line of sight horizon'. Surface Wave Radar (SW). relies on ground wave or surface wave propagation of the radio signal. High Frequency Surface Wave Radar (HFSWR) takes advantage of the diffraction of electromagnetic waves over the conducting ocean surface. OTHR can have a detection range of several thousand kilometers whilst Surface Wave radars have a range of many hundreds of kilometers. Surface wave radar systems, in particular high frequency surface wave radar (HFSWR) systems, have recently been developed to overcome the line-of-sight limitation of microwave radar systems. HFSWR exploits a phenomenon known as a Norton wave propagation whereby a vertically polarised electromagnetic signal propagates efficiently as a surface wave along a conducting surface. 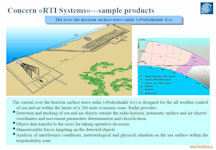 HFSWR systems operate from coastal installations, with the ocean providing the conducting surface. 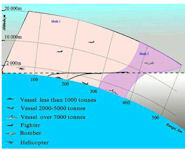 The transmitted signal follows the curved ocean surface, and a system can detect objects beyond the visible horizon, with a range of the order of 200 km. 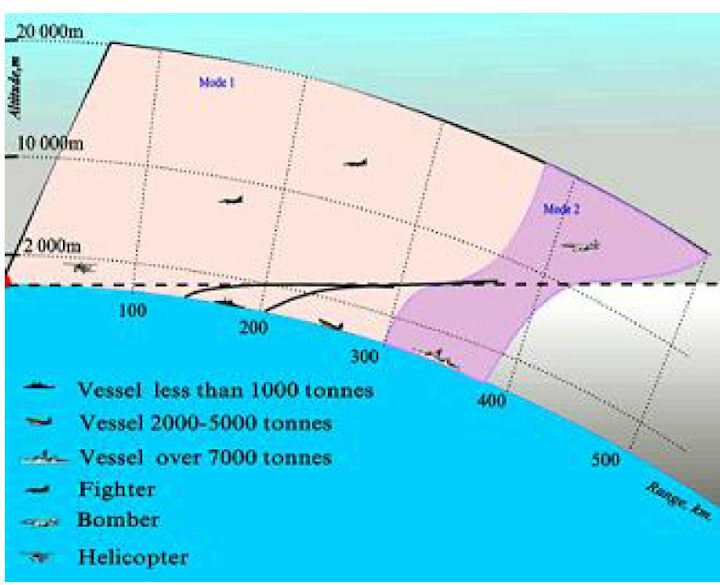 Wave lengths in the High Frequency range are typically 10 to 100 meters and signals in the HF range are used to detect targets at significant distances from the radar installation. In detecting a target at roughly 150 kilometers using HFSWR large error tolerances are experienced in both range (.+-.1 to 2 km) and azimuth (.+-.1.degree.) due to limited band width availability and physical antenna size constraints. The successful detection of a target by a surface wave radar system traditionally involves compromises between a number of factors, including propagation losses, target radar cross-section, ambient noise, man-made interference, and signal-related clutter. 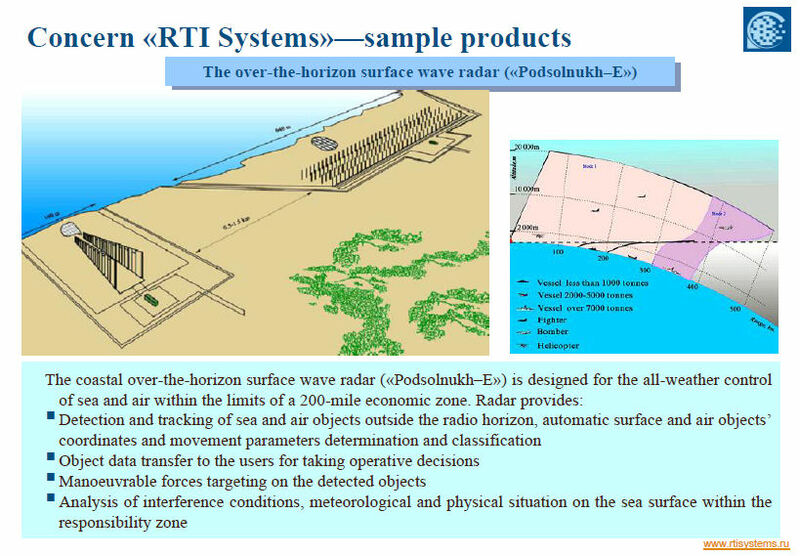 It is desired to provide an improved surface wave radar system and data processing method, or at least a useful alternative to existing surface wave radar systems and methods. The main feature of the “Podsolnukh” (Sunflower) radar station is its over-the-horizon surveillance – it is able to detect sea surface and air objects at a distance of 450 kilometers at different altitudes in the line of sight, and over the horizon. The Podsolnukh can detect surface and aerial targets that are nor within line-of-sight range by means of beyond-the-horizon surveillance. The radar station can simultaneously detect, track and classify up top 300 sea and 100 aerial targets in an automatic mode. The station can automatically detect, track and classify up to 300 nautical and 100 air objects outside the radio horizon simultaneously or sequentially. The radar station is also able to determine their position and give target indications to weapon systems located on ships and air defense means. In 2008 Asian military sources told Richard Fisher that China had placed a new long range Over-the-Horizon (OTH) radar station in Hainan Island. Then at the February 2009 IDEX show in Abu Dhabi a Russian source confirmed to Fisher the sale to China of the 300km range Podsolnukh-E surface-wave OTH radar. In 2009 the Ministry of Defense chose a site in the [Maritime] Kray's southeast for situating a new type of long-range radar (a total of four locations were considered in Maritime Kray for the state-of-the-art complex). On the shore of one of the area's bays, Moscow specialists installed a unique complex for tracking the movements of any foreign surface warships. This location turned out to be the most acceptable from the perspective of the terrain and geodesic position, which was confirmed by the Navy's commission. The complex was developed by scientists at the Moscow Scientific Research Institute of Long-Range Radar. State testing was carried out successfully at the beginning of 2009. The Pacific Fleet was included in the rearmament program through 2014, so the first complex of the series was situated in Maritime Kray. Earlier an experimental model was installed on the Kamchatka Peninsula, where nuclear submarines are based. Later they will be sent to other units across the country for protecting the Northern, Baltic and Black Sea Fleets. The cost of one Podsolnukh is approximately 3 billion rubles [$100 million]. Brazil and Chile are considering the possibility of creating a coastal monitoring system using Russia's Podsolnukh-E over-the-horizon radars, a source from the Russian delegation told reporters at the 18th FIDAE International Air & Space Fair 2014 in Santiago, Chile in March 2014. Exercises involving the newest Russian radar station “Podsolnukh” were held in the Caspian Flotilla, reported the press service of the Southern Military District (SMD) in November 2014. “From the naval forces the exercise involved the “Svijazhsk” and “Uglich” small missile ships”, – the press-service reported. The exercises were conducted to work out the interaction of the “Podsolnukh” radar with ships control systems. Russia’s Black Sea Fleet will be reinforced by the deployment in Crimea of the Podsolnukh short-range over-the-horizon surface-wave radar with 450 km target acquisition capacity, a source in the Russian Defense Ministry told TASS on 17 December 2014. “The sea-based Podsolnukh radar will be deployed in Crimea that will be ‘looking’ to the Bosporus,” the source said. Russia will station additional Podsolnukh (Sunflower) radars that are capable of detecting cutting-edge stealth aircraft, including Lockheed Martin's F-35 Lightning II and F-22 Raptor, to protect the country's exclusive economic zones in the extreme North, the Baltic Sea and Crimea in 2017, Rossiyskaya Gazeta reported 10 August 2016. The Russian Defense Ministry, according to the newspaper, has not made the exact figures public. The press service of Russia's Southern Military District told Rossiyskaya Gazeta that the Podsolnukh is used to scan overwater and aerial regions within the country's exclusive economic zones under any weather conditions. But it could do more. The Podsolnukh is capable of detecting sea surface and air objects at a maximum distance of 500 kilometers (over 310 miles) at different altitudes in line of sight and over the horizon. According to the Global Security website, it can simultaneously detect and track up to 300 sea and 100 aerial targets in an automatic mode. The station is operated by a crew of three people. The Podsolnukh has taken part in the Caspian Flotilla's drills. "In the fall of 2014, the over-the-horizon radar detected various targets and sent their coordinates to the Grad Sviyazhsk and Uglich corvettes. In January, the Podsolnukh detected four low-flying Su-24 bombers. The data was forwarded to the Dagestan frigate, whose ballistic missile defense system successfully locked onto targets," the newspaper detailed. Over-the-horizon stations have a major advantage when compared to other radars. They are capable of detecting stealth objects. For the Podsolnukh, the F-22 and the F-35, the best fighter jets in the US arsenal that could fly deep behind enemy lines, are no different from aircraft that do not use stealth technology. But there is a trade-off. Over-the-horizon radars are inconsistent with the IFF (Identification Friend or Foe) system. "Nevertheless, the Russian military has successfully employed over-the-horizon stations. The Volna system, the Podsolnukh's big brother, has been in service with Russia's Pacific Fleet, scanning water areas at a maximum distance of 3,000 kilometers (more than 1,864 miles). The Volna's length of the antennae is 1.5 kilometers (more than 0,9 miles), its height is five meters (more than 16.4 feet)," the newspaper noted. Three over-the-horizon Podsolnukh radars were in service as of mid-2016 with the Russian Armed Forces. They were recently deployed to the Sea of Okhotsk, the Sea of Japan and the Caspian Sea. The latter had been operational since 2013. The export version of the Podsolnukh has been showcased at several international maritime defense shows.